Barna, George. 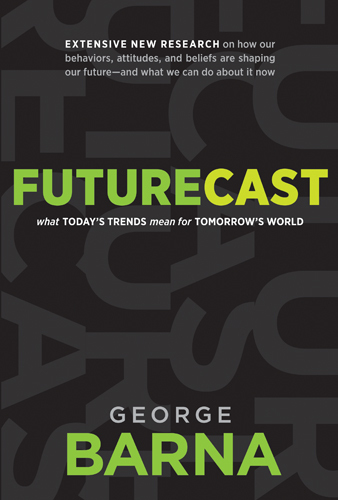 Futurecast: What Today's Trends Mean for Tomorrow’s World. N.C.: Tyndale House, 2011. People in ministry need to be able to exegete the Scriptures and also to exegete the culture in which they seek to minister. Seeing where people are and taking an educated guess to where they will be is part of the second task. To that end, Barna’s book is a helpful resource. It provides both statistical data in clearly defined categories and analysis of the data. The book contains nine chapters, not counting the introduction and two appendices. The chapters are arranged categorically (e.g. family life, attitudes and values, etc.). The writing is fairly straightforward, and I enjoyed Barna’s clarifications of some of the intricacies of evaluating statistical data (e.g., the difference between membership and attendance, pp. 178–9). He also does a nice job of developing helpful categories. For example, see Barna’s distinctions related to church participation, i.e. unattached, intermittents, homebodies, blenders, conventionals (pp. 159–60). There are times when I found the explanation a bit confusing. For example, concerning spiritual gifts Barna writes, “a large share of the Christian public (32 percent) remains either unaware of the existence of these capabilities or aware of the gifts but not cognizant of which ones they possess. Surprisingly, fewer Christians today are aware of the existence of spiritual gifts (68 percent) than was true ten or fifteen years ago (72 percent and 71 percent respectively)” (p. 168, italics mine). The confusion is apparently caused by emphasizing different numbers such as 32% are ignorant vs. 68% who are informed. While one can figure things out by doing the math, I found this unnecessarily confusing. Thankfully, such examples are few and far between. Sprinkled throughout Futurecast are helpful bullet lists and tables. The two tables that I found most interesting were “critical shifts in values and attitudes” (p. 79) and “percentage of adults who believe these Bible stories are literally true” (p. 135). The latter will likely provide introductory material for numerous sermons and lessons. For those looking for introductory material, a topical index would have been helpful. Overall, I appreciated Barna’s work in Futurecast. It provides a snapshot of some of the significant and rapid changes and trends in society today. It is not and should not be the only source for exegeting our culture, but it is a helpful resource to that end. My review copy was provided by Tyndale House Publishers. Savior as a Nomina Sacra?